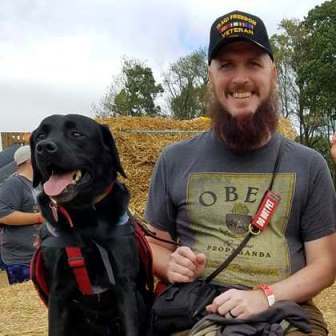 Current Status: Hero Dogs Graduate, partnered with Veteran Kevin V.
Puppy Raiser: Justin & Torrey F.
Hero Dogs Mae added 13 new photos — with Kevin V. McGlynn. 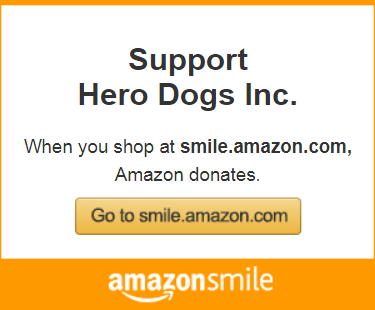 Hero Dogs Mae added 3 new photos. Oh my. It has been forever since I've written to you all. My Veteran has been having to do so much this summer, but I've insured that he still went out and tried to have fun. We went to the Beach, I got to have a sleepover with a great volunteer for my birthday and I even got a puppy cake, my family and I also went to the Poconos for a long get away weekend (6 days). On the way to the Poconos we had to stop and see my vary great friend Jen, who works at a meadery. I didn't get to try any, but my Veteran assures me that they were all wonderful. I also got to visit a living history farm. It was super fun, there were so many smells, I couldn't stand still long enough to fully smell them so I had to keep going back. The only thing that really was scary was when a gang of 30 biker turkeys at the farm became real interested in me. They kept getting closer and closer. My Veteran had to stand between us until they got bored and gobbled away. My little sister also keeps reminding me that I don't get all of the attention. We stop for dinner at an Irish Pub one night and so many of the waitresses we're enamored with her. She of course was being all cute and growling at them, and play peek-a-boo, and tapping them when ever she could reach. At one point my little sister was so engaged with the staff that she would go around and make sure everyone was enjoying their meals. At the beach I got to play in the surf, and roll around in the sand. Of course this is what the beach is for. I of course couldn't stay out too long so I took pity on my Veteran and we would only spend a little time at the beach it self. But I got to see a lot of shops, and smell so many interesting things called shells, unfortunately my Veteran said I couldn't eat them. I guess that's about it for the updates, but please feel free to reach out if you don't hear from me to remind me to tell my Veteran that you said that it was okay to have another scoop of kibble. Happy Belated Birthday Mae! 6 years looks pretty darn good on you! Sorry I couldn’t be there to celebrate, but so happy you got some cake! My Veteran had to go away this past weekend for a wedding I wasn't invited to. While I was sad to be away from him for the first time in 20 months, I had an absolutely fantastic time with a wonderful volunteer for Hero Dogs. She had tons of woods around her house with so many new smells. I also was so surprised to wake up on June 29th to a birthday "cake". In all it was a great weekend, but I was over the moon to see my Veteran pull up the driveway. Hello I am Mae, a Black Labrador trained since a puppy as a service animal for an American Veteran. Click here to read Mae’s full blog.